Just about to be released onto the Australian and New Zealand markets, the new 240 volt PDP from Festool’s sister company Protool is surely be well accepted by trade and serious DIY users alike. 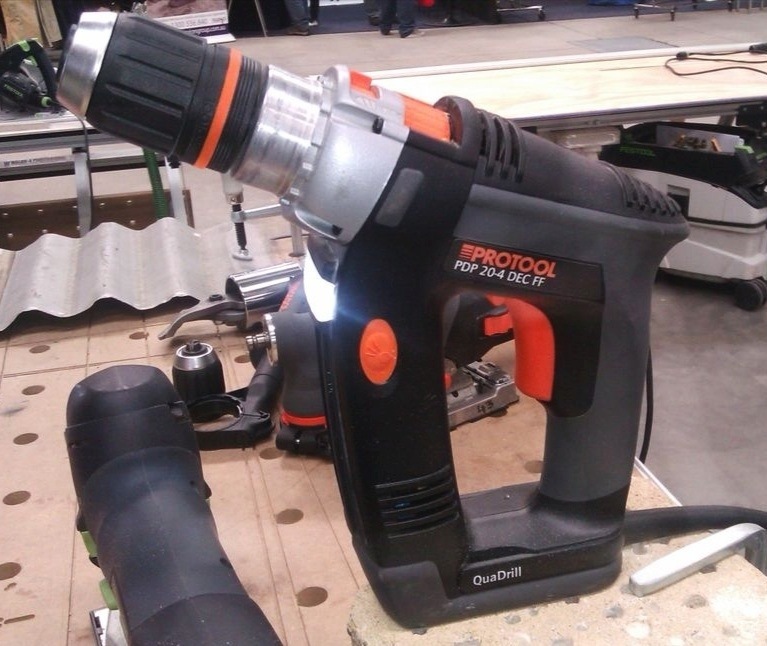 Inspired by the old Protool PDP 20 this new model takes advantage of technological improvements and is fitted with a brushless EC-TEC (electronically commutated – technology ) motor, the same style as those found in the Protool cordless PDC 18 and the Festool T series drills and impact drivers. The result is a tool with amazing speed and power. A four speed gearbox, similar to that on the hugely successful PDC 18 volt cordless drill, gives the PDP 20 a top speed of 4000 rpm in top gear and a low speed of 400 rpm in its lowest gear which is perfect for all those high torque applications. 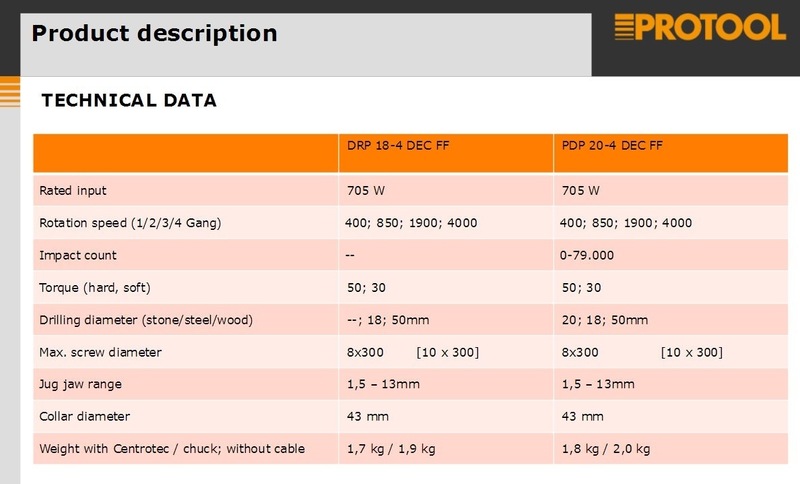 The specs for both the PDP 20 hammer drill and its brother the DRP 18 Drill Driver are shown below. Both drills feature the fast – fix chuck system and come with the unique and highly effective centrotec chuck as standard. 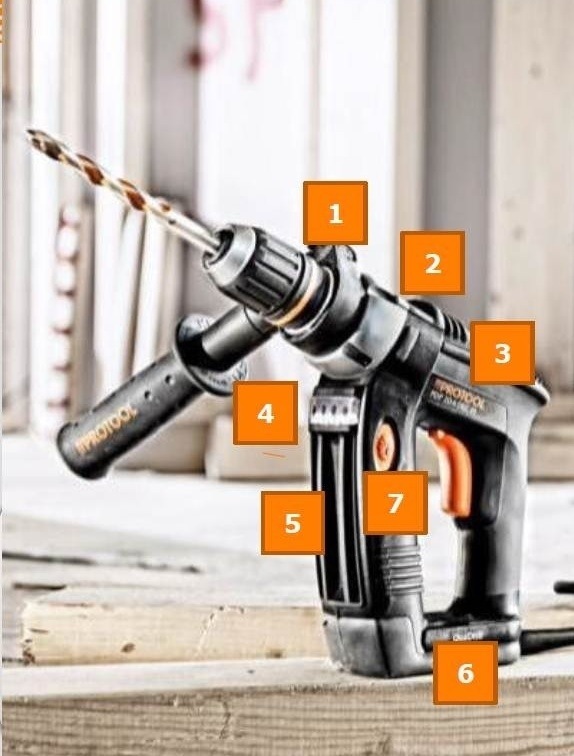 The drills should be available as either standard or set configuration with a heavy duty right angle drive being included in the set version. Please see below ‘for more features on the tools. I had a chance to have a play with the new PDP 20-4 at the recent tradesman’s expo in Melbourne and was blown away by its performance. Coming in at around 2 kg it doesn’t seem possible for a drill this light to have this much power, when it comes to using the tool in timber and concrete it doesn’t disappoint. I’m hoping to get my hands on a test model soon so stay tuned for a full review. In the mean time please drop me an email or post a comment if you have any questions. Interesting to see a mains drill with a belt hook. I wouldn’t have thought that to be common. Can’t wait to try this drill out in te flesh.